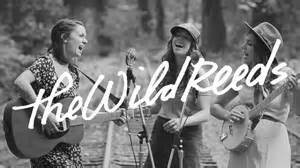 When I first saw The Wild Reeds (TWR), last summer on NPR's online music series called the Tiny Desk Concerts, I was an instant fan. Scrolling and strolling through the pictures and names of recent Tiny Desk performers, my eye fell on theirs and I thought, "that's an interesting name – earthy, alive". So I viewed their performance, a 3-song set, and was hooked: what great voices; cool instruments (including a harmonium, basically a box filled with reeds); wonderful sounds. I'm a father of four daughters, and my wife and I joke that even our family pets are female (dog, rabbit); so in my house, girls rule – good preparation for appreciating a female-fronted band like TWR. I sent the online link of their performance to my oldest daughter, thinking she would like them too, and she did. And I couldn't believe this California band would be playing in just a few weeks in the college town of Chapel Hill, NC, USA, close to where we live. Well, at that point my daughter and I had to see them, and we did, and they were fantastic. They are a genre-blending band of roots and rock music from L.A., with their rock making soil for their roots to grow. “Roots” can mean origins, yet in this case I use it to mean influences, as well as "the leading edge", which keeps reaching out to explore new ground. Such is the case with their new single, "Only Songs", the first release from their upcoming album The World We Built (Dualtone, April 2017). The song is an anthem, a big and joyful rock 'n' roll jam. They've had rock grooves in some of their previous songs, but nothing full-blown like this one, with its badass riff on electric guitar. 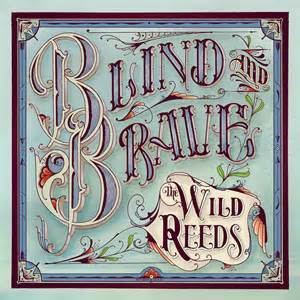 "Only Songs" made me think of their remarkable, "ROY-G-BIV" range: from a song like this one all the way to the other end of their musical spectrum, the sweet and roots-y "Love Letter”, with its nice running banjo, off their debut album Blind and Brave (2014). In this new music, however, roots clearly yield(s) to rock. Though their music weaves among multiple genres, it always returns to the root of this band's power: harmonies from frontwomen Kinsey Lee, Mackenzie Howe and Sharon Silva that are in themselves an instrument. Nick Jones and Nick Phakpiseth round out the band, and the sound, forming the sonic background on drums and bass. I've compared TWR to The Band as well as to The Beatles: the former because of their roots instruments and sounds and stories, their beautifully blending voices and cohesiveness and camaraderie, their dynamics and their heart; and the latter because, what band today has three "magnificent voices" (per Bob Boilen of NPR's "All Songs Considered") who double as a trio of strong songwriters (think Lennon, McCartney and Harrison)? That's a tremendous asset to have. It's a formula for a band that's built to last. They'll need to keep the egos in check, though, because a band that's so stuffed with talent can, like The Beatles, end really badly. I’ll never forget when my daughter and I saw them live in Chapel Hill. 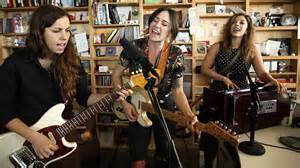 For their finale they sang “Where I’m Going”, a standout from Blind and Brave and the first of the three songs from Tiny Desk. I must say that Kinsey Lee had extra juice in her pipes for that one . . . because she LET – IT – RIP. The vocal riff she threw down that night was equal to, say, Denny Doherty’s in “California Dreaming”. I cite that classic Mamas & the Papas anthem because TWR have covered it, which makes sense because of both bands’ harmonies and California connections. Thinking back to when I saw them online and then later seeing this live show, which cemented my fandom, how exactly that happens is a mystery: something about the molecules in the performer's heart and soul reacting with the same in the listener's, and as a result, a strong bond is made. It is a mysterious, beautiful thing. Looking passed the tall massed stalks to the future, if TWR can keep their generous spirit, keep their camaraderie and their heart, from my vantage I believe they'll be something special in the world of music. Using a quote that might apply, from a recent Bob Boilen interview of Mackenzie Howe: By not losing sight of the larger reason for their being – "the strange and holy experience that is your own creativity" – they'll show that world they were indeed a band built to last. *Those who missed TWR last year in Chapel Hill can see them this year right next door, in Carrboro, where they'll be playing on April 27 at Cat's Cradle. My daughter(s) and I will be there – but no pets allowed.